There is not much to say about the first fifteen minutes in this match as neither side was able to get any rhythm going. USVO led (10-7) by the end of the first period. The two teams were level (12-12) after 14 minutes. Sabrina Reghaïssia then put USVO back in front from the free-throw line as she hit 1-of-2. There was no further action until the game finally game to life during the last 3 minutes of the second period. USVO started the late flourish of points with Francesca Zara hitting a trey and a pair of free-throws from Nicole Ohlde (18-12). Belinda Snell scored for Bourges. But Ohlde and Zara scored again to stretch USVO’s lead to (22-14). Bourges Basket had 90 seconds to turn thing around. Céline Dumerc got things going with her first points of the game. Afterwards Snell scored with Sonja Kireta finishing the scoring after several fruitless attempts. USVO went into the interval with a 2-point advantage (22-20). Both sides, stepping up in intensity after the break started, to play more exciting basketball. Ohlde from USVO was first off the mark but Snell was on hand to hit a shot from her favourite distance from beyond the arc. Shortly afterwards Snell scored after a second attempt to give Bourges the lead (25-24). Bourges stretched their advantage (29-24) before USVO came back to within 1 point. The two teams played cat and mouse for the rest of the period. Endene Miyem scored her first points of the match at end the end of the quarter to give Bourges a 3-point advantage. Amélie Pochet had the last score for USVO but Bourges held the lead (38-37). Miyem, warmed up, took on USVO single-handedly to score 7 consecutive points for Bourges for her side to hang on to their lead (45-42). Emméline Ndongue ended Miyem’s sequence of scoring and by the time Snell hit her third trey of the evening (50-43), Bourges appeared to have broken the resistance of USVO.Reghaïssia’s long shot was the last time USVO were to hit the target for the rest of the match. Whereas Miyem resumed scoring duties for Bourges. Snell hit another trey which became a 4-point play as she was fouled in the process. Bourges went on to defend their title to win (58-45) and with it the Federation cup title for the seventh time in their history. Belinda Snell (MVP) led the scoring with 19 points and was joined in double digits by Kireta and Miyem with 12 and 11 points respectively. Ohlde scored 12 points for USVO. Villeneuve looked the fresher of the two sides but it was Montpellier that struck first in the opening minutes through Elodie Bertal. Géraldine Robert responded almost immediately and the hostilities were launched, with Montpellier holding on to the lead (5-4). Montpellier then went through a purple patch as Villeneuve’s all-round collective game started to pay dividends as they hit Montpellier 13-0 to take command of the game (17-5). Villeneuve finished the first period (24-9).Villeneuve’s players dished out 8 assists and hit 9 from 11 shots from inside the arc during the first quarter. Montpellier started to attack the basket more in the second period in order to reduce the score. Luba Drljaca’s (in picture) knack of hitting big shots at the right moment kept Montpellier at bay. With Shala Crawford picking up her third personal foul and having to retire to the bench, Montpellier were able to reduce Villeneuve’s advantage at the break to 9 points (36-27). After the interval Gunta Basko was at the centre of Montpellier’s actions for her side to reduce Villeneuve’s lead to a single point (40-39). Robert tends to enjoy tight situations and started to assert her authority in the paint. With Drljaca hitting three-pointers at will and Kathy Wambe on a mission Villeneuve went into the final period with their advantage restored (59-45). Villeneuve quickly put the game out of Montpellier’s reach as they stretched their lead to more than 20 points (69-47) with seven minutes to play. Then they went on to pace themselves to win (81-60). Villeneuve have recorded their first ever victory in the Federation Cup. Drljaca led all scoring with 22 points which included 6-of-7 from the land of many. Robert scored 21 points while Wambe contributed 19 points and dished out 6 assists. 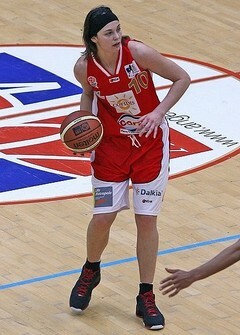 Bertal was the leading scorer for Montpellier with 21 points.